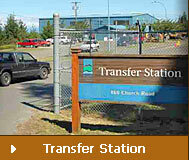 The Regional Landfill is located about 5 kilometres south of downtown Nanaimo. The landfill site opened in the 1940s and is approximately 37 hectares in size. The 13.7-hectare operational area of the site has a high-density plastic liner and has been receiving municipal solid waste from the Regional District of Nanaimo since 1991. The 8.8-hectare unlined portion of the site was closed in 1996. The Regional Landfill operates under an operational certificate issued by the BC Ministry of Environment. Through its Environment Protection Programs, landfill gas and leachate are collected from both the lined and unlined areas of the landfill site. Leachate is directed into the sanitary sewer system for treatment at the Greater Nanaimo Pollution Control Centre. The landfill gas collection system directs the gas to an on-site flare station where the methane is burned to reduce greenhouse gas emissions and improve air quality. As part of the Regional Landfill’s Greenhouse Gas Emission Reduction Initiatives, methane will be sold to a private company and provide source of green power to the BC Hydro grid. Commercial customers that access the Landfill Face or designated Commercial Unloading Areas and the Transfer Station Commercial Building must wear a Hard Hat, Hi-Visibility Clothing and Safety Footwear. The Region Landfill's drop-off area for self-haul customers. Self-haul (small business or residential customers) from within the Regional District of Nanaimo can dispose of garbage and drop off Recyclable Material, 8 a.m. to 5 p.m., Monday to Sunday, excepting Statutory Holidays. All traffic enters the site via the scalehouse where loads are assessed and weighed according to Accepted Materials and Rates. The scalehouse attendant directs customers to the paved drop-off area, which is separate from the landfill’s active face. Attendants at the drop-off area are available to further direct customers. Safety: All customers and visitors must comply with site safety regulations. Covered/Secured Loads: Loads must be covered or secured to avoid littering roadways. Avoid Line-ups: To avoid line-ups at the Regional Landfill bring materials during non-peak hours: 8 a.m. to 10 a.m., Monday to Friday. Yard and garden waste is ground and sent to a local composting facility. Mixed garbage from self-haul customers is transferred from drop-off bins to the landfill’s active face. Yard waste, clean wood waste, scrap metal, cardboard, and paper are hauled to third party recycling facilities for processing. The Regional Landfills active face. Commercial haulers are directed to the active portion of the landfill, which is accessed via an unpaved roadway. Wood waste, yard and garden waste and controlled waste are deposited separately from regular garbage for special processing. Mixed garbage deposited at the landfill active face is spread and compacted. The waste is covered with a mix of ground wood waste and soil to minimize odours and litter being dispersed from the site by the wind or animals. The Regional Landfill has a bird control program to minimize the disruption to equipment operators and the spread of litter caused by scavenging gulls and other birds. Trained hawks and a handler are on-site daily and are used to chase birds from the active face. A trained Harris hawk is used to chase birds from the landfill's active face. 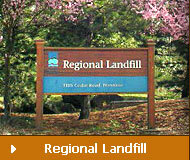 Schools and other interested groups may arrange a tour of the Regional Landfill by calling (250) 722-2044.